This morning, we made a prediction based on the objects that appeared in our classroom. 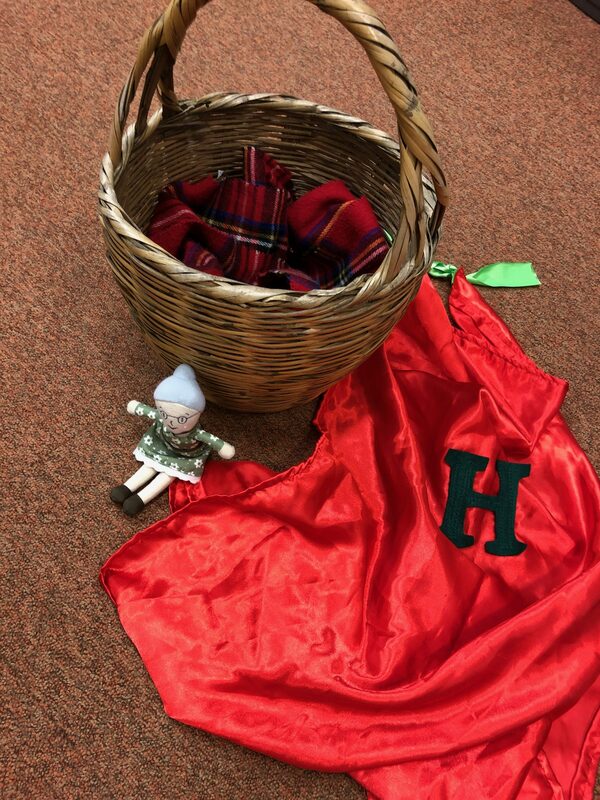 We had many different predictions, from Super Hero Granny, to Little Red Riding Hood. This is our new Talk for Writing story and we will be learning the story this week and it will be our focus over the next 4 weeks, where we will learn the story, imitate the story, innovate a new story and then invent a new story based on the skills and plot pattern we have learnt. Below is a copy of the new story we are learning. Today we learnt up to the line Suddenly, along came a brave woodcutter. See if you can have a go at retelling the first part of the story at home. We will learn the rest this week! Once upon a time there was a girl called Little Red Riding Hood because she always wore a red coat with a bright red cap. Early one morning, her mother said, “Take this basket of food to your grandmother but whatever you do, don’t dilly dally on the way.” Into the wooden basket, she put a huge slice of sweet fruitcake, a juicy apple and a large cheese. So, Little Red Riding Hood walked and she walked and she walked until she came to the middle of the forest. It was dark and she could hardly see where she was going. She could just see old trees standing like tired giants. Their crooked branches twisted overhead like writhing snakes. She heard the wind hissed through the autumn leaves that fluttered like moths. Feeling tired, Little Red Riding Hood decided to rest under a huge tree. Suddenly, along came a brave woodcutter. “Where are you going?” asked the woodcutter and Little Red Riding Hood told him. Unfortunately, a grey wolf was hiding behind a tall tree, listening to everything they were saying. Greedily, it licked its wet lips, pawed the rough ground and ran off the find Grandma’s cottage. 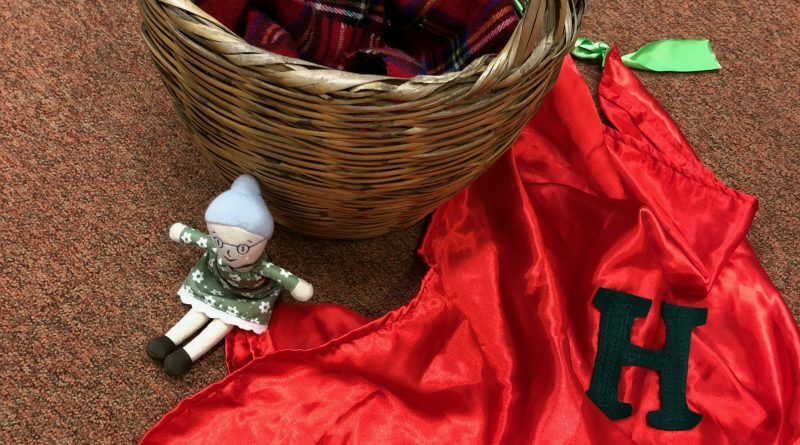 When Little Red Riding Hood reached Grandma’s cottage, she let herself in. Grandma was lying in the bed but she looked very strange. “What big ears you’ve got!” said Little Red Riding Hood. “All the better for hearing you with,” replied Grandma, twitching her pointed ears. “All the better for seeing you with,” replied Grandma, leaning forwards. “All the better for hugging you with,” replied Grandma, smacking her lips. “All the better for… eating you with!” shrieked the wolf, leaping from the bed. Little Red Riding Hood screamed as the wolf opened its huge jaws. Luckily, at that moment, the woodcutter dashed into the cottage and killed the wolf with not one, not two, but three, mighty blows from his axe! For, he had followed the hungry wolf through the deep, dark forest tracked him to Grandma’s cute cottage and arrived just in time. Both Grandma and Little Red Riding Hood’s Mother told her off for speaking to the wolf and she promised never to dilly dally again. Finally, they all sat down and enjoyed a nice slice of fruitcake and some cheese. Four leaf clover – our story is over.